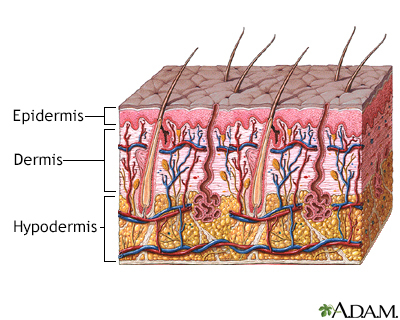 Skin abscesses are common and affect people of all ages. They occur when an infection causes pus to collect in the skin. A skin abscess may occur anywhere on the body. Your health care provider can diagnose the problem by looking at the affected area. The drainage from the sore may be sent to the lab for a culture. This can help identify the cause of the infection. You can apply moist heat (such as warm compresses) to help the abscess drain and heal faster. DO NOT push and squeeze on the abscess. Numbing medicine will be put on your skin. Packing material may be left in the wound to help it heal. You may need to take antibiotics by mouth to control the infection. If you have methicillin-resistant Staphylococcus aureus (MRSA) or another staph infection, follow instructions for self-care at home. Most skin abscesses can be cured with proper treatment. Infections caused by MRSA respond to specific antibiotics. Call your provider right away if you develop new symptoms during or after treatment of a skin abscess. Keep the skin around minor wounds clean and dry to prevent infection. Call your provider if you notice signs of infection. Take care of minor infections promptly. Marks JG, Miller JJ. Localized erythema. In: Marks JG, Miller JJ, eds. Lookingbill and Marks' Principles of Dermatology. 5th ed. Philadelphia, PA: Elsevier; 2013:chap 15. Que YA, Moreillon P. Staphylococcus aureus (including staphylococcal toxic shock syndrome). In: Bennett JE, Dolin R, Blaser MJ, eds. Mandell, Douglas, and Bennett's Principles and Practice of Infectious Diseases, Updated Edition. 8th ed. Philadelphia, PA: Elsevier Saunders; 2015:chap 196.